Follow SI's latest stories and updates from Thursday's NCAA tournament action. Everything you need to know about Thursday's NCAA tournament action. 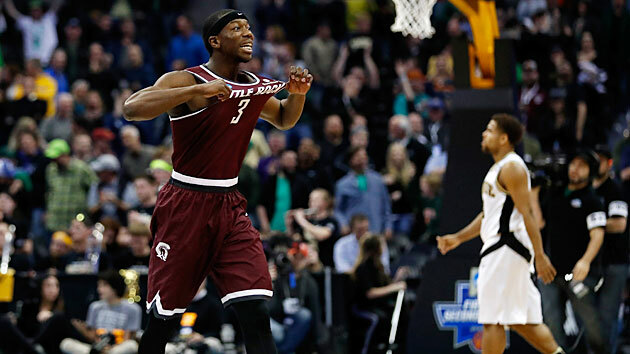 In his last game before the NCAA tournament, Arkansas-Little Rock's Josh Hagins scored five points on seven shots against Louisiana-Monroe. You didn’t even notice him on the court, especially if, like me, you weren’t watching the Sun Belt championship game and had no idea who Hagins was. But I know now. Hagins scored 31 points against Purdue on Thursday, but that’s like saying Usain Bolt won the Olympic 100-meter dash or a hockey locker room stinks. It’s true, but it still feels like a massive understatement. The Trojans trailed Purdue 63-49 with 4:06 left. Hagins scored 11 points in that 4:06, including a three-pointer from Steph Curry territory to force overtime. Later he hit a floating, leaning two that should have counted for four. Little Rock won, 85-83. Day 1 of the NCAA tournament was not an all-time classic, but a) that just means Day 2 probably will be, and b) Day 1 was still pretty great. To be fair: Wichita State could give a lot of coaches the night sweats. The Shockers sent the Wildcats and Miller packing, preferably with fresh shirts, and if you were surprised, you must be on the selection committee. The Shockers are No. 9 in Ken Pomeroy’s rankings (Arizona is No. 16) and are an established national power at this point. (Wichita State’s last three tournaments: Final Four, loss to eventual finalist Kentucky, Sweet 16.) Making Wichita State a No. 11 seed was unfair—not just to the Shockers, but to Arizona. Speaking of non-surprise “surprises": Officially, 12th-seeded Yale stunned Baylor in the West Regional, but really: Were you stunned? Have you ever watched the Bears in the tournament? With each passing minute, Scott Drew looked more like Marco Rubio, and that’s not a political cheap shot: He really did look kind of like Rubio to me. I couldn’t tell if it was the hair or the fact that he came in with so much hype and showed no ability to adjust in key moments. Yale looked just as good as Baylor, and better if we’re evaluating uniform designs, and if you’re wondering how Yale outrebounded Baylor, you shouldn’t be surprised. Yale is a terrific rebounding team, ranking 20th in the nation in rebounds per game. Yale vs. Duke on Saturday should be a blast. The performance of the day, though, belonged to Hagins, who joins Bryce Drew and C.J. McCollum and Kemba Walker and Tyus Edney and, well, you can insert nine other names off the top of your head. We have to move along before Friday’s games start. Safe to say, though, that the names you come up with will be guards. This is a guards’ tournament. This has been true for a long time. Tim Duncan made one Elite Eight in four years at Wake Forest. Shaquille O’Neal won one tournament game in three years with LSU. That was eons ago (Shaq averaged 27.6 points, 14.7 rebounds and five blocks as a sophomore, then returned to school—imagine THAT today) but the tournament has not changed as much as you might think. Purdue earned a No. 5 seed thanks to a bruising inside game led by 7-footer A.J. Hammons and 6'9" freshman Caleb Swanigan, who is so big that his nickname is “Biggie”. That’s just not a recipe for NCAA tournament success. Teams that rely heavily on one or two great post players usually don’t last long. There are a lot of reasons for this. For one, by the time a 7-footer rounds out his game, he is usually in the NBA, and for another, the three-pointer has traditionally been a bigger factor in college games (though that has changed). Guards rule in March. We saw this clearly when Hagins hit those ridiculous shots, and when Purdue had the ball late in regulation and nobody knew how to dribble it. There are exceptions, but really: Not that many. This is why the people who picked Stony Brook to beat Kentucky didn’t really think it through. You don’t beat a team with several future NBA players, including an outstanding college point guard (Tyler Ulis) with a team led by one impressive big guy (Jameel Warney), unless the team with all the NBA players is shaving points, drunk or both. Look around Thursday, and you saw great guards making big plays. 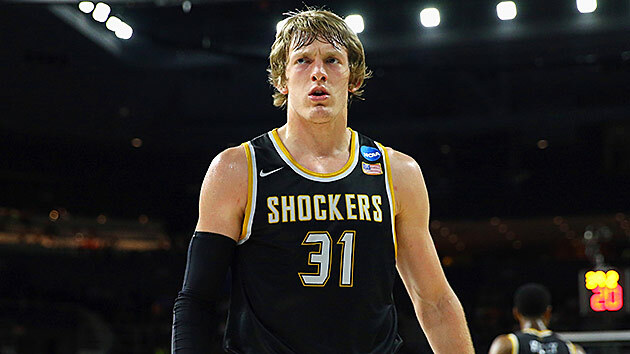 Wichita State had Fred VanVleet and Ron Baker. Butler had Kellen Dunham. Yale had Makai Mason, who drained all 11 of his free-throw attempts on his way to 31 points. There are 16 more games waiting to be unwrapped Friday. Enjoy. College basketball fans had to stay up late to watch the last of Thursday’s slate of NCAA tournament games. The Seton Hall-Gonzaga game didn’t tip off until 10:53 p.m. ET and when it finished early Friday morning on the East Coast, the Bulldogs became the seventh lower-seeded team to win in the first round with a 68–52 win. Gonzaga’s frontcourt duo of Kyle Wiltjer and Domantas Sabonis carried the load (34 points and 21 rebounds) for the Bulldogs while Seton Hall’s leading scorer, sophomore guard Isaiah Whitehead, struggled mightily to score the ball. Whitehead was 4 of 24 from the field and an NCAA tournament-record-tying 0 of 10 from behind the arc for a team-high 10 points. He appeared physically and mentally frustrated, needing to breath from an oxygen mask multiple times in the game and committing a flagrant-1 foul wrestling for a loose ball in the first half. Whitehead did a nice job setting up his teammates with eight assists, but the Pirates’ shooting woes weren't limited to him. As a team, Seton Hall was 20 of 61 (32.8%) from the field and 8 of 21 (38.1%) from the free throw line. The Pirates cut their deficit to six points with less than seven minutes left in the game but their comeback bid fell apart. Forward Angel Delgado fouled out with 4:45 left in the game and Ismael Sanogo had to be helped to the locker room with a dislocated right shoulder 23 seconds later. On the next play, Michael Nzei turned the ball over on the inbounds pass, which led to a bucket for Sabonis that put the game out of reach. For the eighth straight season, Gonzaga has won at least one game in the NCAA tournament. The Bulldogs won their sixth straight game at a road or neutral site by knocking off a surging, incredibly athletic Seton Hall team. After a regular season that left more to be desired, the Zags defeated one of the hottest teams in the country and held one of the country’s premier scorers to the worst shooting night of his career. Even with its first round exit, Seton Hall took a step forward as a program this season, winning the Big East tournament and making its first NCAA tournament appearance since 2006. The team has a strong core with six sophomores and it only loses rotation guard Derrick Gordon to graduation. The future looks bright at Seton Hall, but the Pirates will have to experience the rest of this year’s tournament as viewers, while Gonzaga advances to the second round yet again. A second round matchup against No. 3 seed Utah awaits Gonzaga on Saturday, which will be a battle between strong West Coast teams with prolific big men. 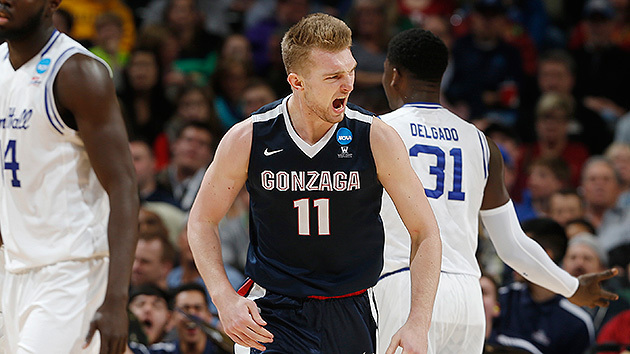 Sabonis will match up against fellow sophomore Jakob Poeltl, who is averaging 17.6 points and 9.0 rebounds per game. Both teams have tremendous size and experienced veterans, setting the stage for an exciting matchup in Denver. Kris Dunn did everything he could to make up for his absent first half. 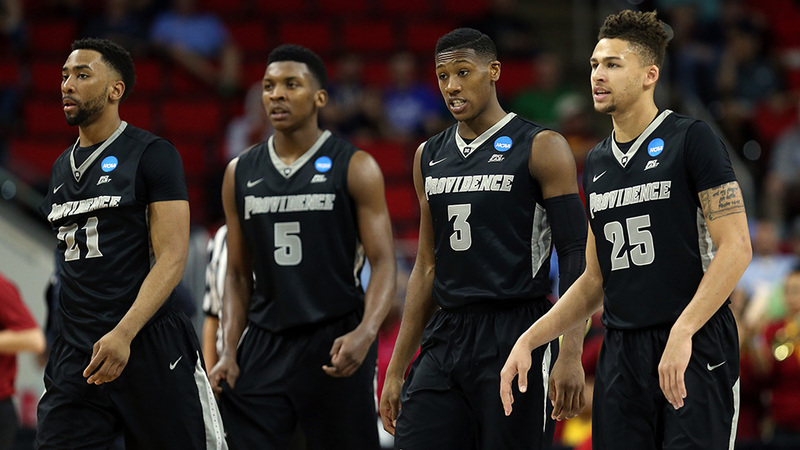 The Big East Player of the Year’s outstanding second half elevated the Friars, and Providence grabbed its first tournament victory since 1997. Rodney Bullock found a seam in the USC defense with 3.3 seconds remaining, and his lay-in propelled Providence to a thrilling 70–69 win over the Trojans on Thursday night in Raleigh. USC looked prepared to seal the game in the final 30 seconds, but two missed free throws on the front ends of one-and-one fouls opened the door for Dunn and Providence. Dunn’s long-range three tied the game at 68 with 1:27 remaining before a series of chaotic sequences of turnovers, blocked shots, missed free throws and, eventually, Bullock’s game-winning layup with 1.5 seconds remaining. Dunn sat the final 11:20 of the first half with foul trouble, but had 13 points in the second half to help keep the Friars in a game they looked ready to lose on several different occasions. Sophomore forward Ben Bentil led the Friars with 19 points and Bullock, the hero, finished with 16. The game was fast-paced, much the way USC coach Andy Enfield likes it, and the Trojans looked primed to grab their first tournament win since 2009. But a disastrous final minute of poor ball movement and missed free throws denied Enfield his signature win since taking the USC job in 2013. It gives the nation at least one more opportunity to see Dunn, who is expected to be a lottery pick in this summer’s NBA draft. The Friars were forced to play at USC’s kinetic pace, but still established an inside presence with Bentil and knocked down nine three-pointers to hang in the game. While coach Ed Cooley’s team will be heavy underdogs against North Carolina on Saturday, the Friars showed they can handle and win against teams with high tempo. Providence meets No. 1 North Carolina on Saturday afternoon in front of a heavy Tar Heel presence in Raleigh. A wild finish between No. 9 Providence and No. 8 USC on Thursday night ended with the Friars scoring on a last-second, go-ahead layup. After a bizarre final two minutes filled with missed opportunities, free throws, and turnovers on both ends, Providence salvaged a late chance and completed the come-from-behind win. After a loose ball deflected off USC, setting up an out-of-bounds play under the basket, Rodney Bullock freed himself beneath the basket and banked in a wide-open look. The Trojans missed a full-court attempt with a second left to seal the result, 70-69. 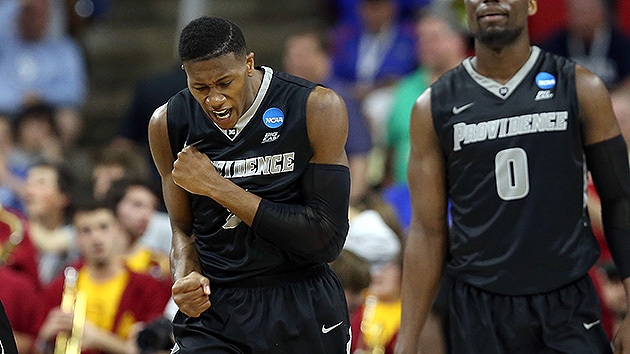 Providence advances to face No. 1 North Carolina on Saturday. Ron Baker scored 13 points and Fred VanVleet added 12 as No. 11 Wichita State beat No. 6 Arizona, 65–55, in one of the more impressive performances from the opening day of first-round play in the NCAA tournament. The Wildcats struggled to score early against the Shockers’ defense, which entered Thursday leading the nation in adjusted points allowed per possession, according to Kenpom.com. Arizona missed 12 of its first 15 shots, scored only 0.64 PPP in the first half and trailed Wichita State by double digits going into the break after VanVleet and Baker, the Shockers’ star senior guards, combined for 17 points. It only got worse from there for Arizona, as Wichita State opened up a 24-point lead midway through the second half. The Wildcats cut into the lead with an 11–0 run, but the Shockers regained control with a pair of baskets by forward Anton Grady and then cruised to a comfortable victory. The defining image of the final 20 minutes was Wildcats coach Sean Miller, having already perspired through his dress shirt, frustratingly shouting instructions from the sidelines. Wichita State was considered a bubble team entering selection Sunday. In its two games, however, it’s looked like one of the better squads in the tournament. After notching a 20-point win over a Vanderbilt team with multiple NBA prospects in the First Four, the Shockers rolled an Arizona team that led the Pac-12 in offensive efficiency during conference play, per Kenpom. The Wildcats could not contain VanVleet and Baker, and the Shockers stifled Arizona on the other end of the floor. If there were any skepticism about Wichita State when it dropped two of three games to Illinois State and Northern Iowa during conference play, the Shockers have erased it. Coach Gregg Marshall’s team looks primed to make a deep run. Wichita State will take on No. 3 Miami in the second round on Saturday in Providence. The Hurricanes beat No. 14 Buffalo, 79–72, earlier on Thursday. Miami should pose a tougher challenge for the Shockers than Arizona, as the Hurricanes are of the nation’s top offensive teams, ranking 12th nationally in adjusted points per possession, according to Kenpom.com, and are also led by a talented and experienced backcourt. Fresno State turned a budding blowout into an interesting game in the second half, but Utah was ultimately too much, using a 19–2 run after falling behind by one point to notch an 80–69 win in its first-round matchup in Denver. Lorenzo Bonam led the way with 17 points, while Jakob Poeltl had 16 to go along with a career-high 18 rebounds. The Utes won nine straight games before getting waxed by Oregon in the Pac-12 championship game last weekend, so even though they were 8.5-point favorites over Fresno State, it had to feel good to get back on the right path. Utah was absolutely dominant on the glass, but it racked up 20 turnovers, which kept the Bulldogs in the game much longer that it appeared they would be at halftime. Fresno State was among the most active defenses in the country this season, but Utah is going to have to play a much cleaner game on Saturday to advance to the Sweet 16. It also can’t afford a scoring drought from Poeltl like the one he suffered in the second half against the Bulldogs. Utah moves onto the second round to take on the winner of Seton Hall and Gonzaga in what should be a wildly entertaining game, regardless of the opponent. North Carolina’s 25–6 run over the first 8:30 of the second half put away any hope that history would be made in Raleigh, but the Tar Heels may have some concerns after a difficult first half in their 83–67 win over Florida Gulf Coast on Thursday. Senior forward Brice Johnson anchored a blistering start to the second half to keep the Heels from becoming the first No. 1 seed to ever lose in the first round in front of a raucous home crowd just 27 miles from campus. The win showcased some of the best and worst that Carolina has to offer. Their usual breakneck pace on offense and Johnson’s tenacious interior defense withered the Eagles as soon as the second half started, but a host of defensive lapses in the first half kept the game unnecessarily close at half. The No. 16 Eagles, three years removed from their magical run to the Sweet 16, pulled to within one point at halftime after making nine of 11 their last eleven shots to end the first half. But that energy disappeared within the first minute of the second half as North Carolina overwhelmed the smaller, thinner and presumably tired Eagles both inside and from the perimeter. The second half was a prime exhibition of why some pundits have North Carolina winning the NCAA tournament. 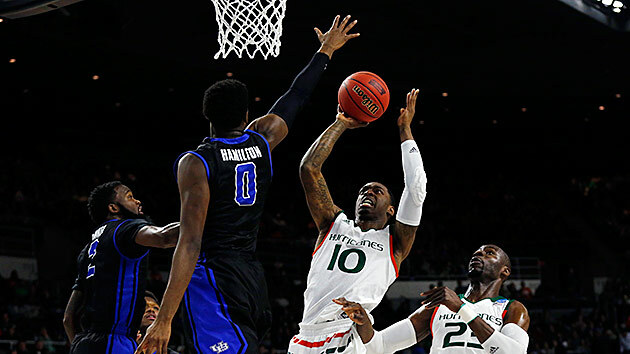 Johnson, the runner-up for ACC player of the year, finished with 18 points, seven rebounds and an astounding eight blocks, but it was his post play that prevented FGCU from keeping the game close. After the Eagles succeeded with a series of interior passes and close-range baskets in the first half, Johnson and junior forward Kennedy Meeks locked down the post to keep the Eagles to just 27 second-half points. Johnson’s eight blocks set a North Carolina record for an NCAA tournament game. Florida Gulf Coast’s one-point deficit at halftime was due primarily to strong interior play and effective finishing near the basket. The Eagles entered halftime shooting 60.0% from the floor and 11 points from burly sophomore forward Antravious Simmons, a reserve who averaged only seven points per game all season. It was a surprise that the Eagles thrived against North Carolina’s large lineup early, sinking nine of their last eleven shots of the opening 20 minutes and outrebounding the Heels in the first half. The Heels’ interior defense wasn’t considered a weakness entering the tournament, but surrendering 40 first-half points (16 in the restricted area) in the opening 20 minutes was troubling. Johnson’s standout second half may have mitigated those worries, but it was hardly the mark of a No. 1 team to be exploited so seamlessly. North Carolina will take on the winner of No. 8 seed USC and No. 9 Providence on Saturday afternoon. No. 12 seed Chattanooga stayed competitive for the first 15 minutes or so against No. 5 seed and Big Ten regular-season champion Indiana, but ultimately fell to the Hoosiers, 99–74. A three-pointer by reserve sophomore guard Robert Johnson with 3:58 left in the first half gave Indiana a six-point lead, which ballooned to nine points at the half and didn’t shrink below seven for at any point in the second half. 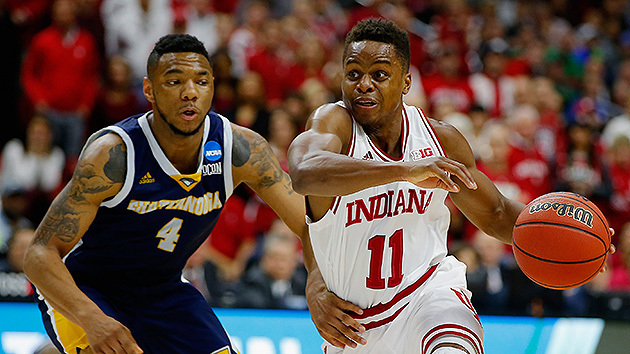 Senior guard Yogi Ferrell led IU with 20 points and 10 assists, his first career double double. Indiana looked like a potential No. 2 or 3 seed in the NCAA tournament at the end of the regular season, but a loss in the Big Ten tournament quarterfinals to Michigan helped to put the Wolverines in the Big Dance—and dropped Indiana to the five-seed line. But the Hoosiers looked motivated to show they were undervalued heading into the NCAA tournament. Five Hoosiers—Ferrell, freshman forward OG Anunoby (14), freshman forward Thomas Bryant (13), junior forward Troy Williams (12) and senior forward Max Bielfeldt (10)—scored in double figures. Indiana’s offense is elite, coming in at No. 7 in adjusted efficiency on kenpom.com, and it showed on Thursday, as Indiana shot 64.9% from the floor and 58.8% from three. Indiana will play the winner of No. 13 seed Stony Brook and No. 4 Kentucky. If the Wildcats prevail, as they are favored to, it will set up a colossal second-round matchup between two of the most storied programs in college basketball. Des Moines could be the place to be on Saturday. After it looked like No. 5 Purdue was pulling away in the middle of the second half, No. 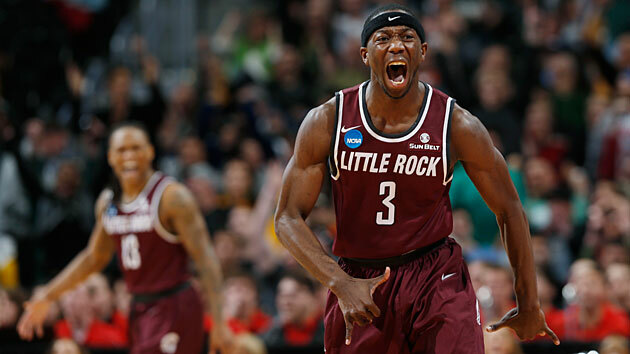 12 seed Arkansas-Little Rock stormed back on an 18-5 run in the last three and a half minutes to force overtime on a step-back, 25-foot three-pointer from senior guard Josh Hagins with just five seconds left. It took two overtimes for these two offensively challenged teams to settle it, but the Trojans finished the upset, beating the Boilermakers 85-83 in Denver to advance to the second round of the Midwest Regional. Hagins led all scorers with 31 and shot 8 of 10 from the free throw line. Junior forward Lis Shoshi added 14 points and nine rebounds. For Purdue, sophomore forward Vince Edwards led his team with 24 points and grabbed 12 rebounds. Little Rock, the Sun Belt champions, was a popular upset pick in this game, and it proved it has the talent to advance even further in the bracket. Led by the third-ranked scoring defense in the nation and offensive punch from Hagins (12.8 ppg), the Trojans are uncomfortable to play against and have enough offensive punch (39% from three, 17th in the nation) to stay in games. On Saturday in Denver, Arkansas-Little Rock will face No. 4 Iowa State. The Cyclones beat No. 13 Iona 94-81 earlier in the day. Austin Peay kept this one close—through the first two media timeouts. The Governors started 3 of 4 from the field but a 6–5 lead was the biggest, and last, advantage they had in the game. Kansas sophomore guard Sviatoslav Mykhailiuk came off the bench and made back-to-back threes as the Jayhawks were off to the races. Guard Josh Robinson was the lone bright spot for the Governors, scoring 14 first-half points—10 more than any of his teammates—and finishing with 24. Their offense dissolved into too much dribbling and isolation offense while Kansas's size, depth and athleticism was too much to handle. The Jayhawks took a 48–28 lead into halftime. 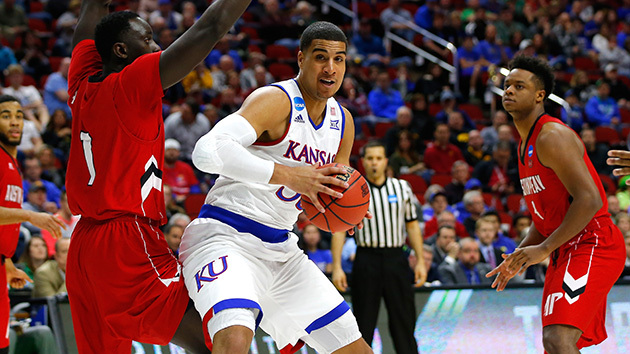 A 10–2 Austin Peay run early in the second half forced Kansas coach Bill Self to call a timeout, but Kansas quickly regrouped and coasted to a 105–79​ victory. Four Jayhawks scored in double figures, led by Mykhailiuk's career-high 23 points. First and foremost, No. 1 seeds are still undefeated against No. 16 seeds. Kansas put away a pesky Austin Peay team with relative ease and took away the Governors' strengths in the process. Austin Peay senior center Chris Horton is the nation's leader in offensive rebounds and the Governors made a team-record 16 threes in their last game. Kansas out-rebounded Austin Peay by seven and held the Governors to 4 of 15 from behind the arc. The Jayhawks handled the early resistance and the second-half foul trouble of Devonte' Graham and Wayne Selden Jr. with composure. Kansas played like the No. 1 overall seed in the first round. Kansas will face No. 9 seed Connecticut in the Round of 32 on Saturday in Des Moines. The Huskies overcame an 11-point deficit against Colorado in the first half for a 74–67 first-round win Thursday afternoon. Kansas has won 15 straight games and UConn has won its last five. Yale sophomore point guard Makai Mason scored 31 points as the No. 12 Bulldogs upset No. 5 Baylor, 79–75, in a West Region matchup at the Dunkin’ Donuts Center in Providence. Yale came out firing against a Bears team with superior length and athleticism. Mason knocked down seven of his first 12 shots for 17 points in the first half, and forwards Brandon Sherrod and Justin Sears tallied 18 points and nine rebounds to give the Bulldogs a strong presence inside against Bears senior big man Rico Gathers. 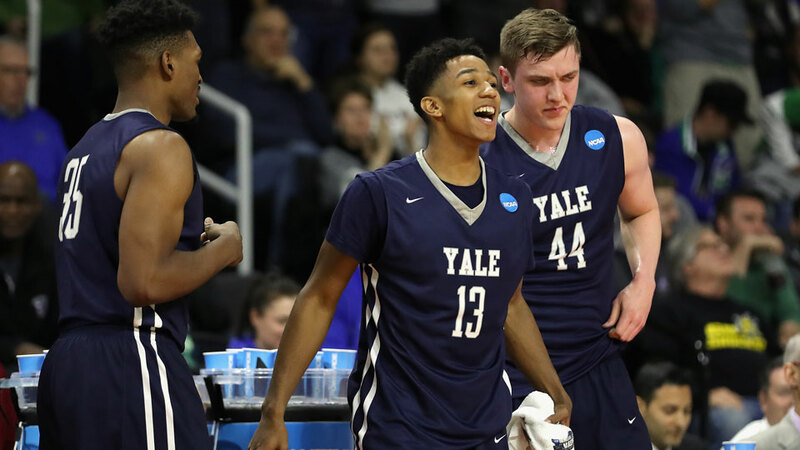 After taking a five-point lead into the break, Yale weathered an early surge by Baylor and then retook control midway through the second half. A three-point shot from Blake Reynolds gave the Bulldogs a six-point advantage around the 13-minute mark, and then Yale kept exploiting Baylor inside, with Sears converting a layup with just under nine minutes remaining to make it a nine-point edge. Wing Taurean Prince sparked the Bears with a powerful putback dunk a few minutes later and Baylor cut the Bulldogs’ lead to one inside the final minute, but Sherrod hit a pair of key free throws late to seal the win. Yale will face No. 4 seed Duke on Saturday in Providence. The Bulldogs fell to the Blue Devils, 80–61, in Durham, N.C., in November. Duke handled UNC Wilmington, 93–85, in its first-round matchup earlier on Thursday. No. 12 Yale upset No. 5 Baylor 79–75 in the first round of the NCAA tournament on Thursday. Oh wow, someone else bailed a Yale man out of his own obvious mistake. That never happens. Good to see kids from Yale finally catch a break in life. Seriously though, congrats to the kid from "Blank Check." Yale will play Duke in the round of 32.